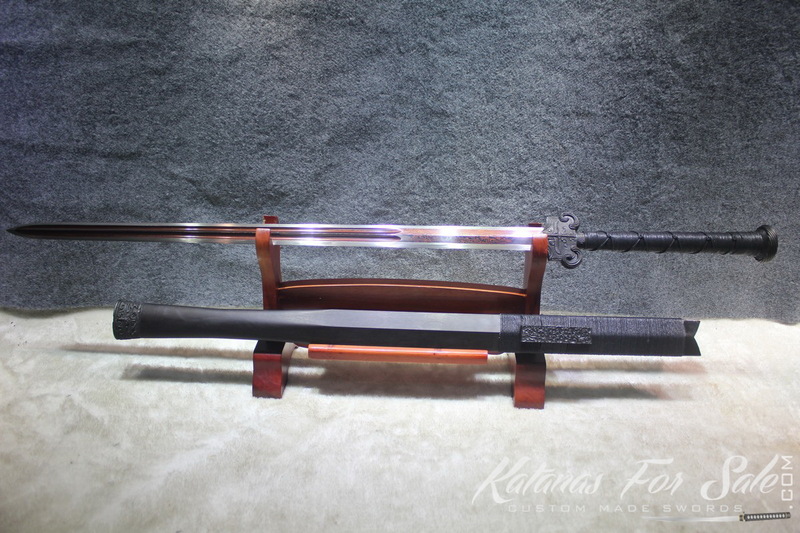 Categories: 1060 High Carbon Steel, 1095 High Carbon Steel, Chinese Swords, Folded Steel. Tags: 1095 carbons steel sword, chinese Jian, Chinese swords, Han Wu Jian Sword. 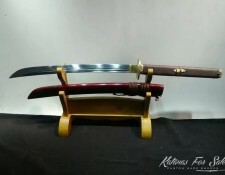 Material: Handmade 1060/1095 Carbon Steel Blade (13 folds, 8192 layers). This is the Black Plated Forge Folded Handmade Han Wu Chinese Sword Jian. 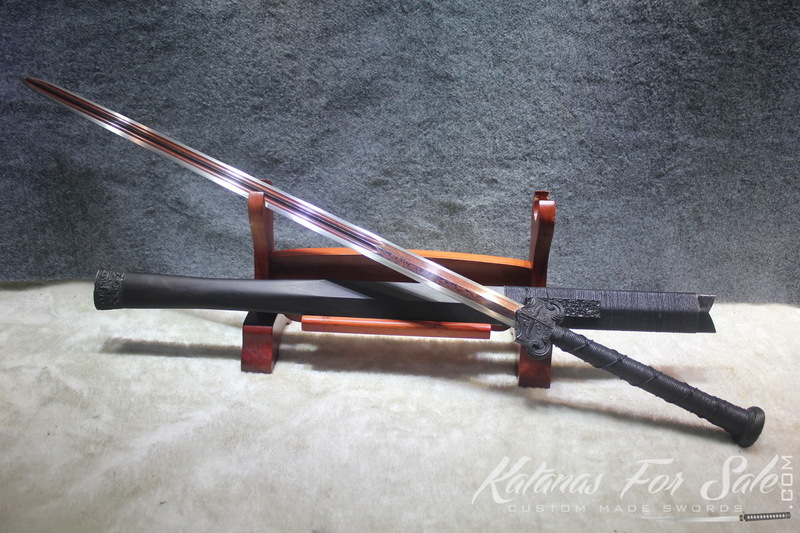 The blade of the Jian has been constructed from a combination of 1060 and 1095 forge folded carbon steel. The pommel of the sword is solid black plated metal with Chinese scroll work design entwined in deep relief. 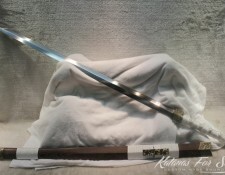 Blade: The blade was constructed in the SanMai method. The high carbon steel edge forms a core with medium carbon steel sandwiching it. These pieces are known as Cheeks. 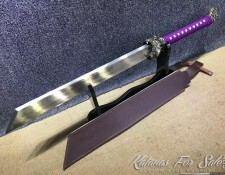 The Cheeks are composed of altering layers of steel, this sword has 8192 layers. 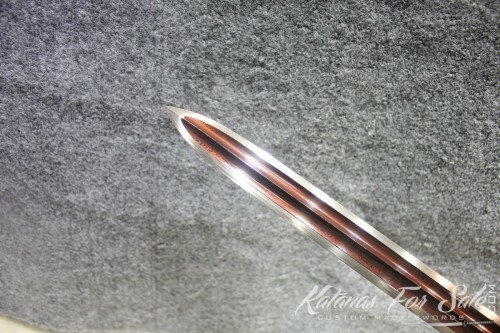 These layers create a distinct pattern on the surface of the blade. 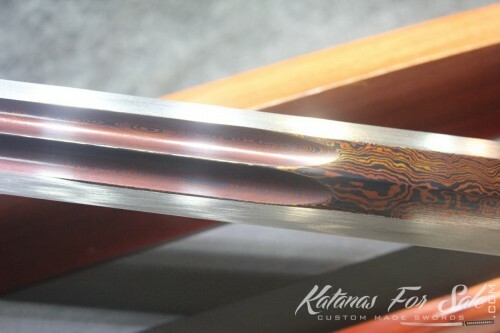 The result of this forging method is similar to a Japanese Katana where the sword that is exceptionally hard yet still flexible. After the construction of the layers and the core, the sword was tempered and quenched in the dragon spring water of Longquan. It was then hammered into the desired length and shape. The core of the blade has been treated with red acid thus creating a cool reddish looking effect. 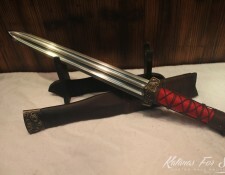 The red acid does not affect the quality or functionality of the blade. 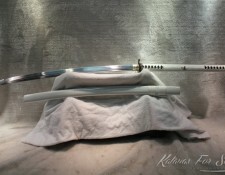 The tempering of the blade gives the sword the ability to retain a 45 HRC on the body of the blade and a 58 HRC on the edges. The difference in the HRC hardness allows the blade to be versatile and have no worry of losing its edge or shattering. The sword was then hand sharpened. Similar to polishing this is also an art form. 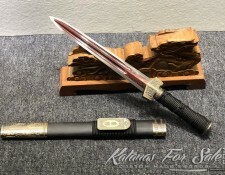 A typical a sword sharpener will charge $25 for each inch sharpened. It takes days to a week to sharpen the whole sword. Scabbard: The scabbard of the sword is made from black hardwood with a natural finish. It has been constructed from hardwood with four handmade high quality metal fittings. 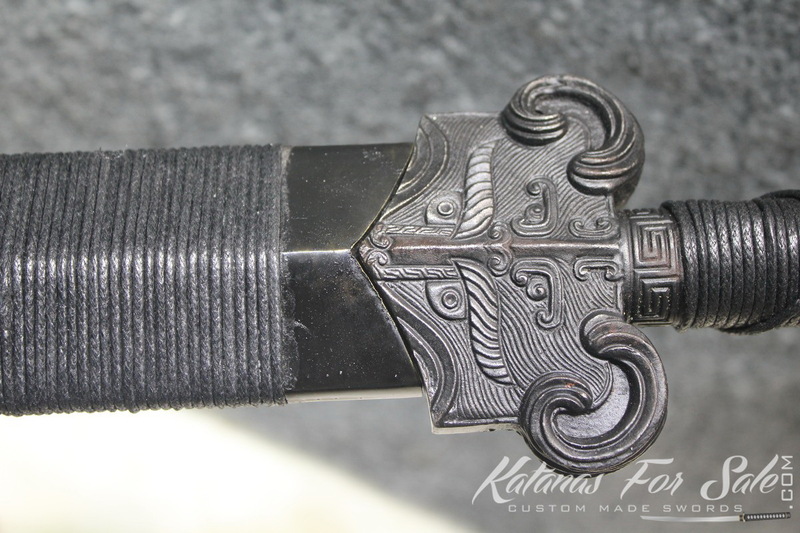 Each fitting is highly detailed with Chinese scroll work. 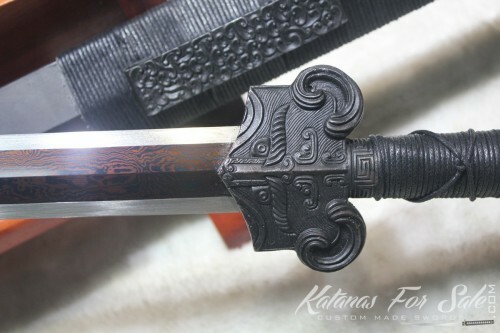 Handle: The handle of the sword is also made from black hardwood, matching the scabbard. 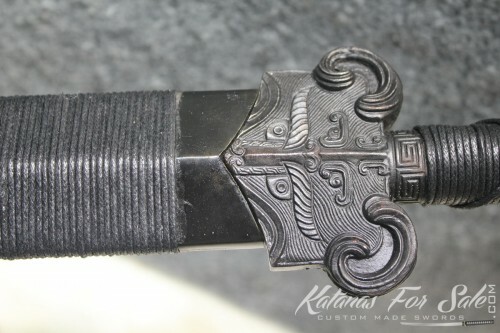 The guard and pommel are and the rest of the sword, is a replica of the actual sword used by the Emperor Wu of the Han Dynasty in 156 BC. The scroll work is historically one of the most beautiful in Chinese history, the style named after this dynasty. The scroll work and cut out design is reminiscent of the simplistic beauty and prestige of the Han Dynasty. 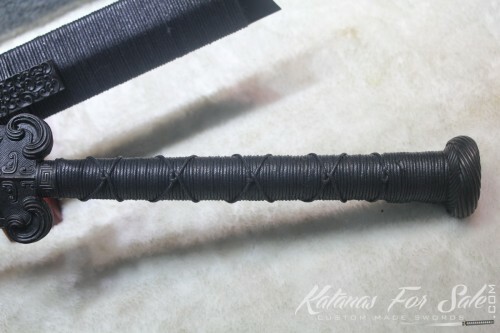 Handmade 1060/1095 Carbon Steel Blade (13 folds, 8192 layers). The blade comes full tang and sharp. 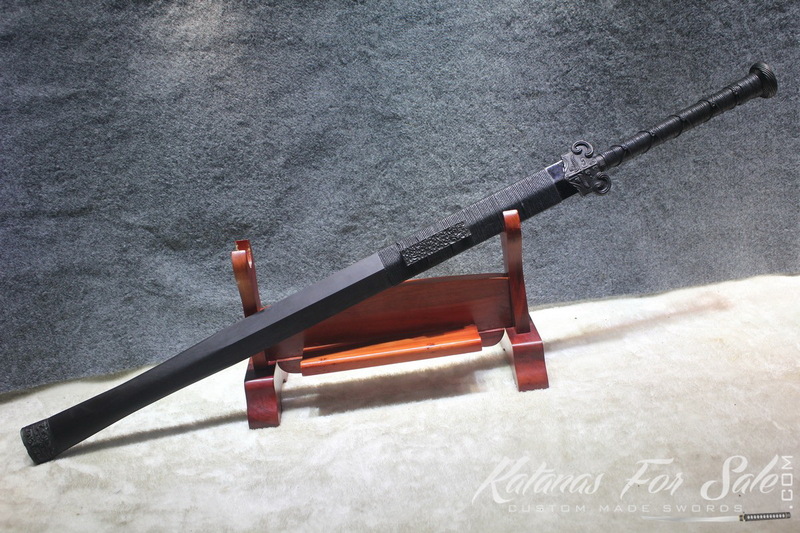 Scabbard: The scabbard is a high quality black hardwood.